According to an AppleInsider report, Carphone Warehouse added 4 placeholders for the new iPhone models to their inventory today. It’s a big one after the two hints that we came to when AT&T leaked out iPhone 32GB and T-Mobile Austria accidentally advertised the 32 GB iPhone. 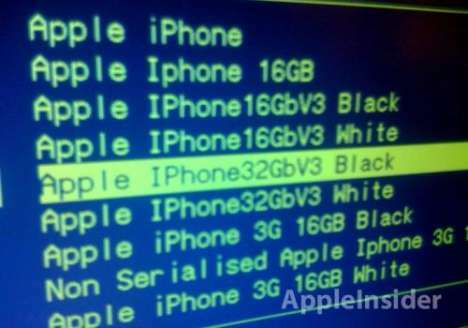 A person known to have access to such information has provided their inventory system screenshot that shows placeholders for both 16GB and 32GB iPhones in both white and black. These new iPhone are listed among the previous and existing iPhone models, having reportedly cropped up just hours ago. Walt Mossberg says New iPhone at WWDC? Upcoming iPhone to be Called the ‘iPhone Video’?